Now in their 3rd edition, these awards acknowledge the achievement of young people between the ages of 16 and 35, who have stood out for their entrepreneuring capacity in innovative projects. The call for entries to the IMPULSA Awards 2012 closed on March 30, 2012. The prizes will be presented by H.R.H. 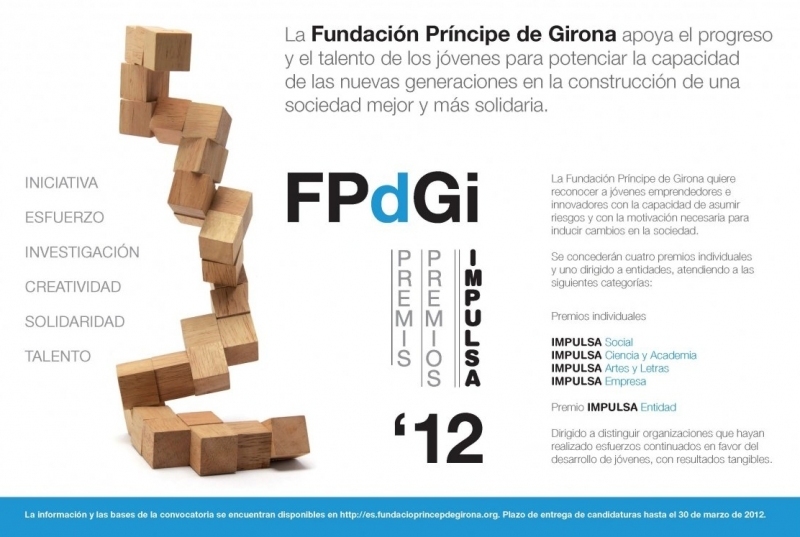 the Prince of Asturias and of Girona at the IMPULSA Forum, which will be held in the coming month of June in Girona. Conceived for the purpose of fostering initiative and effort, the IMPULSA Prizes promote research and creativity, solidarity and the development of the talent of young people who want to build a fairer world in a globalized environment. In this way, the Prizes help to acknowledge the projects and initiatives carried out by young entrepreneurs who are willing to run risks and who have the motivation needed to produce changes in society. The IMPULSA Awards include four awards for individuals and one for organizations. The IMPULSA Prize to an Organization acknowledges the achievements of entrepreneuring institutions that work in favor of youth along the Foundation's lines of action. 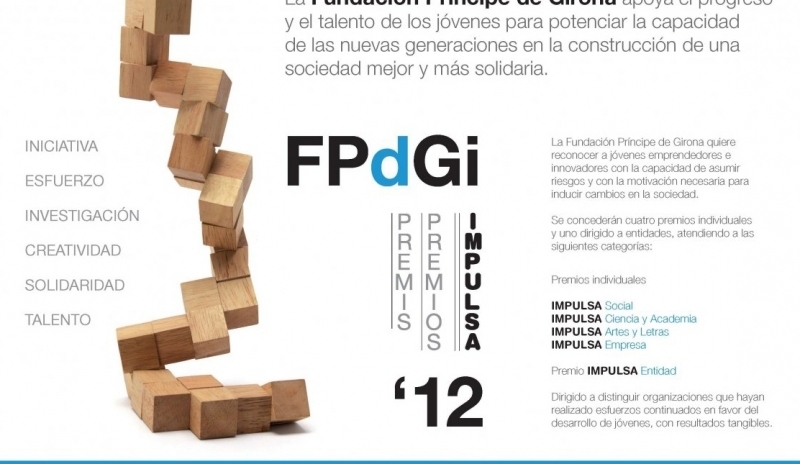 In the individual categories, the IMPULSA Society prize distinguishes young social entrepreneurs with projects that foster the integration of marginalized groups and those at risk of exclusion; the IMPULSA Science and Academics prize acknowledges scientific experiences or projects that have a large potential of future development; theIMPULSA Arts and Literature prize honors talented young people who are carrying out promising work in any field of art or literature; and the IMPULSA Business prize distinguishes young people with entrepreneuring initiative in the performance of a feasible original business project. Each of the awards is endowed with 10,000 euros in prize money and a reproduction of a work by the Spanish sculptor Juan Muñoz. Entrants in the individual categories should be between the ages of 16 and 35 years. TheIMPULSA Awards are awarded in each category by a jury consisting of members of the Foundation's Advisory Council, external experts in the respective field and prize-winners from previous editions.